As a lawyer, a strong online presence is a crucial part of your advertising strategy. A polished, user-friendly website will show potential clients that you are a professional and a prominent member of your field. It will also provide you with a space to define your expertise and post testimonies from satisfied clients. WordPress is an excellent option for a busy attorney with little time to put into web design and maintenance. WordPress themes are easy to work with and manage, even if you don’t have a lot of technical skill. For an even higher quality product, you may want to consider hiring a web developer to create the site for you. Their professional abilities combined with the convenience of WordPress will provide you with a website you can be proud of at an affordable cost. The themes on this list are specifically designed to meet the needs of a modern lawyer. With them you can highlight the areas of law you practice, provide information about members of your firm, and share testimonials from previous clients. Consultation forms included in the themes will also make it easier for potential clients to schedule an appointment, making your firm even more appealing. 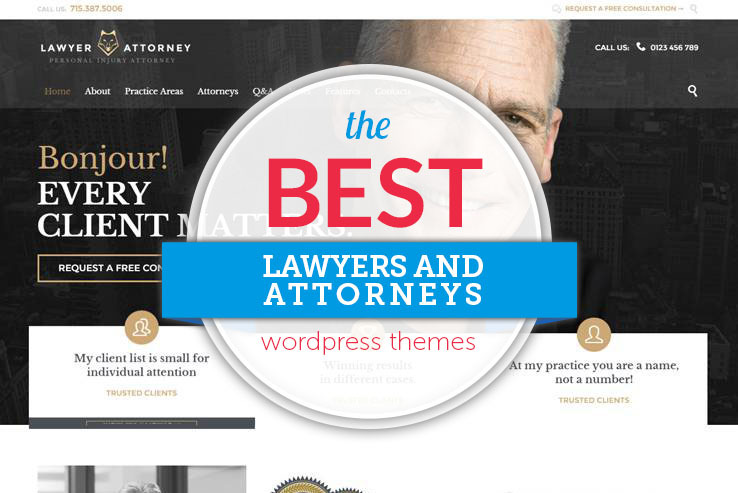 Here are some the best WordPress themes for promoting your law practice. 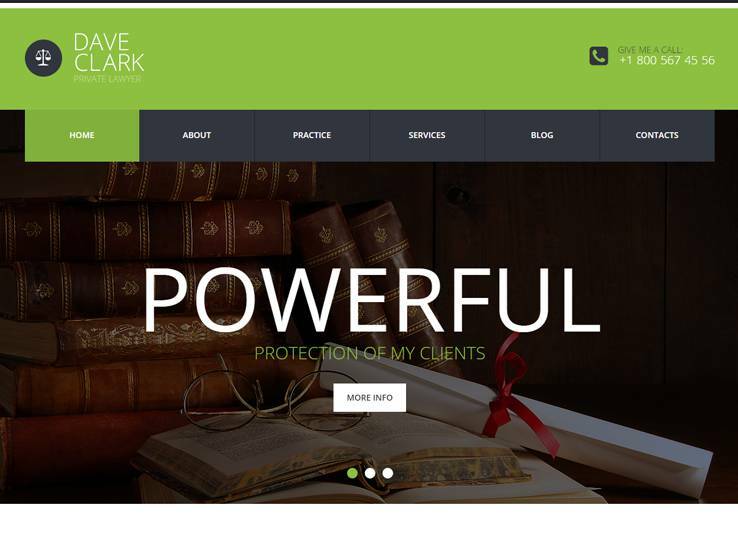 Consider the Lawyer Pro theme if you’re looking to have a modern and professional website for your law firm. The template brings all the tools and features needed to create a unique and effective law-related website, including a portfolio to present your past accomplishments, testimonials to boost your credibility and attract more business, and a team section to showcase the members of your team. We enjoy this theme’s header design as it includes a large banner area with an overlaying contact form, which will help you generate more leads for your law firm. You can also display your phone number and social media icons at the top so people can easily connect with you. 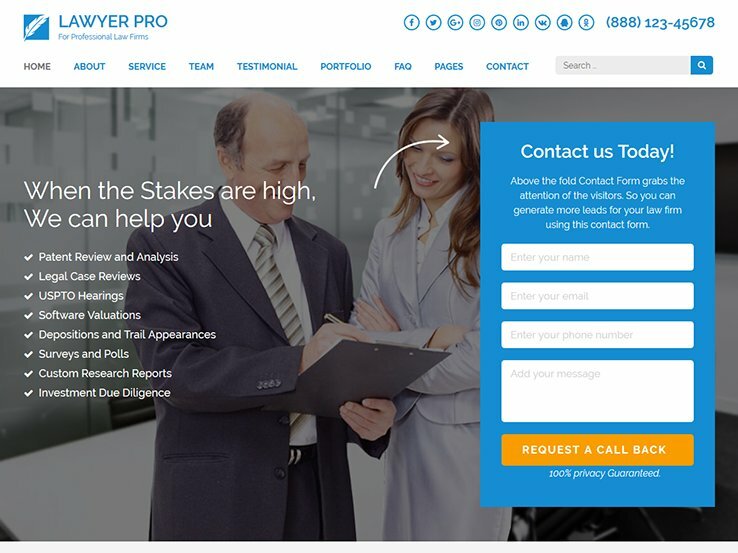 In terms of customization options, the Lawyer Pro theme provides 9 pre-designed header layouts to choose from, unlimited colors, and hundreds of fonts to help you create a truly unique website. Also, you’ll find 7 pre-designed page templates, which will greatly save your time. These include contact us, FAQ, portfolio, testimonial, team members, services and about us. 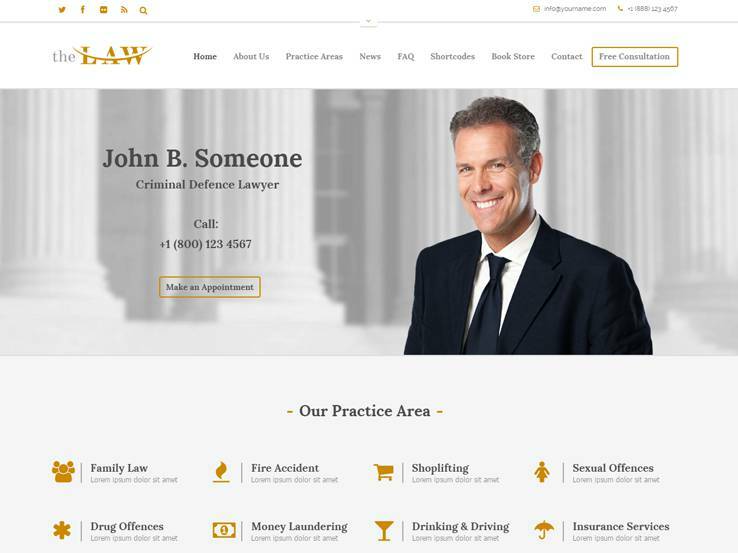 The Justice theme is ideal for a lawyer who is seeking a very business-style look for their website. With numerous page templates and unlimited color options, this theme allows you to create a one of a kind site to set yourself apart from the competition. For further customization, the Slider Revolution premium plugin will take your site to the next level by helping you create stunning sliders with animations and overlaying buttons. The Visual Composer premium plugin makes site creation with Justice a breeze for beginners and advanced users. This elegant tool allows you to drag and drop design elements so you don’t have to design them yourself. Justice is all around simple to use with visual shortcodes and easy integration with the WooCommerce plugin. Your fully responsive site will also look great on mobile devices. Lawyer is a stellar theme from the folks at TemplateMonster. If you are looking for a full-featured blog with a responsive layout, this clean and modern website might be for you. This theme puts the spotlight on your content by getting rid of the clutter and putting the focus on the message. Your logo will be front and center for instant brand recognition, while the customizable header ensures a warm welcome to visitors. The attractive Services page gives you a place to emphasize your specialties and showcase what makes you right for the job. Navigating your site will be easy for potential clients with a slider that appears as soon as you open the page and a drop down menu, all of which looks great on a mobile device. The Lawyer theme will also help you make connections across the web and in real life with a footer widgetized for social media buttons, recent posts, and contact information. 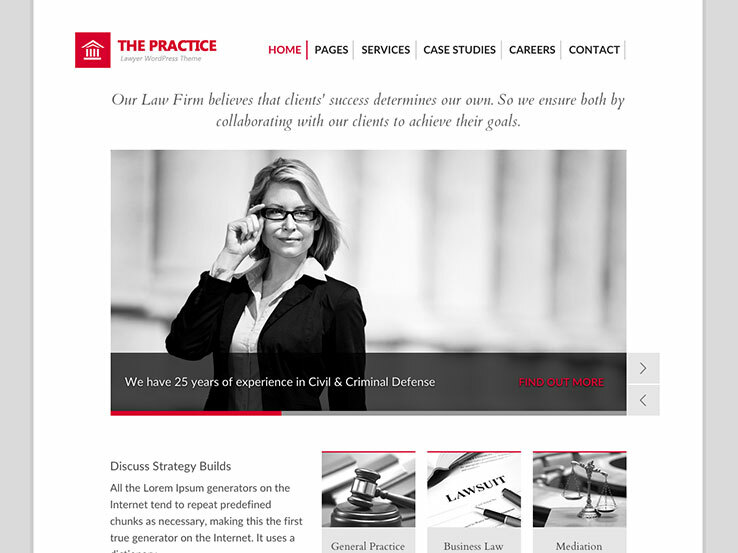 The Practice from ThemeFuse is tailor-made for law firms that want a sleek, minimalist website. This theme uses simple backgrounds that give it a clean look but can also be customized to create a unique site for your practice. The easy to use backend features allow you to upload images and display your best content, making your site stand out without the headache. The animated slider is optimal for keeping clients informed about recent news and developments by showcasing that information at the top of the page. The Practice theme will meet both your most basic and your higher end needs. Several built-in page layouts make adding pages for case studies, About Us information, and contact information effortless while shortcodes help you quickly build buttons, add tabs, and create pricing tables. Widgets on the sidebars help you connect with clients through social media and recent posts. The standout features are the built-in SEO, translation features, and white label branding making the Practice theme a great choice for any law firm. 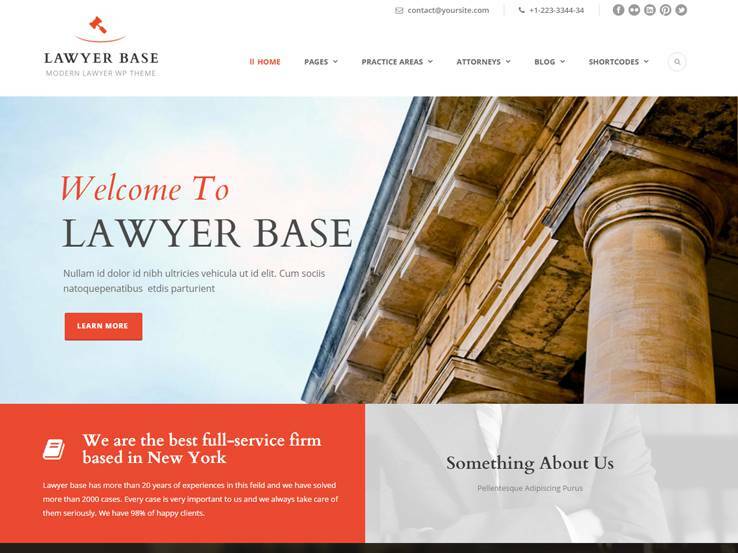 Lawyer Base is an exceptional choice if you’re seeking a modern look for your site. The contemporary design of this theme includes a master slider plugin for a stylish banner at the top of the main page to strengthen your message. The theme also supports multiple post formats giving you the freedom to customize the site to fit your firm’s character. The impressive admin panel helps you further personalize the site with tons of features for uploading images, changing colors, and modifying widgets. The Goodlayers Page Builder is a fantastic addition, simplifying site design by allowing you to drag and drop design elements into place. A useful importer adds demo content to the site with a single click and the mega menu is a mega bonus for sites that require multiple pages. The most impressive feature of this theme is its integration with WooCommerce, allowing you to accept payments directly through your site. The Law theme presents a strong and modern style with plenty of features to customize your site to fit your needs. The outstanding Visual Composer plugin makes designing your website quick and painless while the live color customization feature shows you the changes you’ve made without having to refresh the page. Seven sliders are included to let you showcase your most important content in style and twelve header styles ensure that you can find the right look for your firm. This theme also includes over 450 icon choices to keep your page clean and free from excess text. The Slider Revolution plugin assures smooth sailing for visitors by adding text overlays and buttons to direct them to promotions and consultation pages. Options for forms and contacts will make your site and your firm more accessible and the WooCommerce integration will streamline payments for you and your clients. This multipurpose theme has a completely responsive interface that looks great on mobile devices ensuring that your clients can reach you wherever they are. If you’re looking for a more colorful approach to your website, the Private Lawyer theme is an excellent choice. This modern looking theme includes an elaborate array of color choices allowing you to easily match your site to the rest of your brand. Private Lawyer is fully responsive and can easily be edited to create custom post types, add images, links, quotes, and galleries. To create an even more unique look, take advantage of the custom typography option and pull your readers in with stylized text. Fantastic sliders will further impress visitors with vivid imagery. Design couldn’t be easier with Private Lawyer’s two-step installation process and more than 80 shortcodes for implementing buttons, tabs, and lists. You can easily connect with clients with custom widgets that create social sharing and comment modules as well as sliders to encourage users to contact you for a consultation. And if you operate in a culturally diverse area, the impressive multilingual feature will ensure that your firm is accessible to everyone. 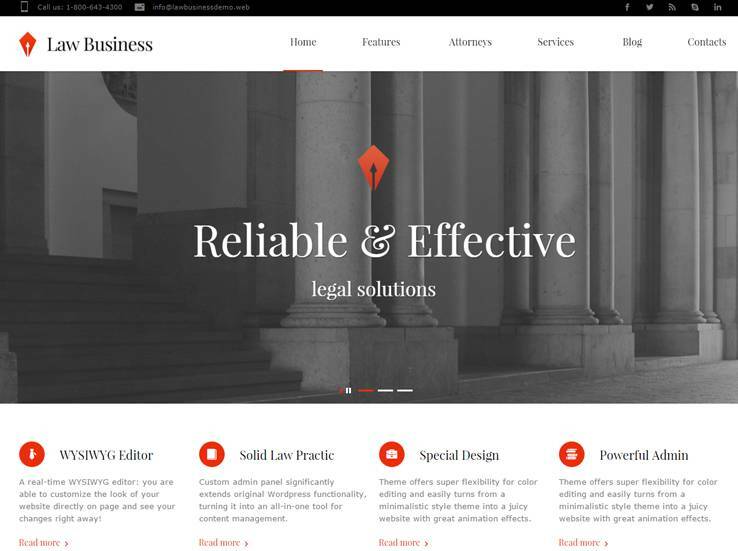 The Law Business theme has a very professional look with lots of white space to ensure that your content is the main focus. Two attractive custom post types – one for services and one for testimonials – will help you maintain a streamlined look for your site while highlighting your skills and accomplishments. Several law-related icons are also available to give your site more visual appeal and the custom background is an excellent opportunity to brand your site. But the most unique feature of this theme is a Twitter feed slider to connect with your clients on social media. More than 23 shortcodes are included with the Law Business theme, some of which specifically cater to the law world and can really turn your site into something special. The custom form builder tool is a must-have for any modern lawyer. With it, clients can schedule a consultation with ease, right from your website. The custom widgets are a great bonus of this theme and the Revolution Slider plugin lets you add professional animation and overlaying text and button options for easy navigation on a computer or mobile device. 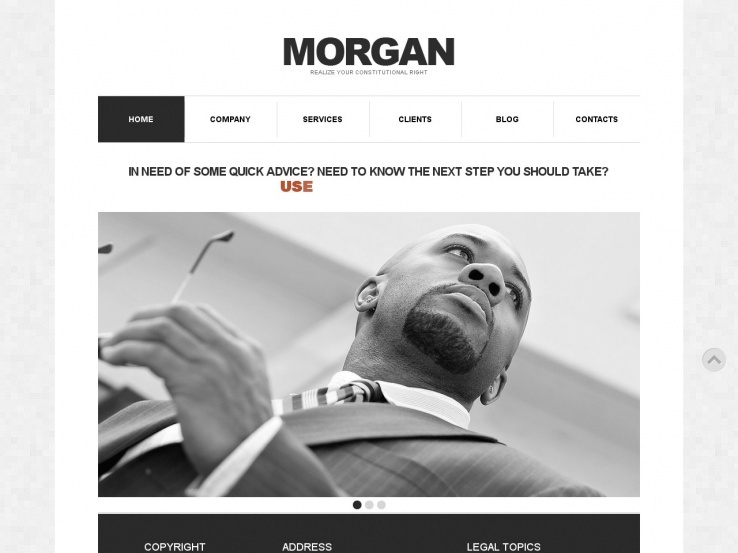 The Motus theme is a business and corporate template with a design that’s perfect for lawyers. The design of this theme is modern and flexible with options for a single or multipage setup. This first-rate feature allows you to create several modules to customize your website and make it fit your brand. One of the best modules can be used to feature the lawyers in your firm with photographs, titles, and biographical information. Images, from employee photographs to specialized icons, look great on Motus. 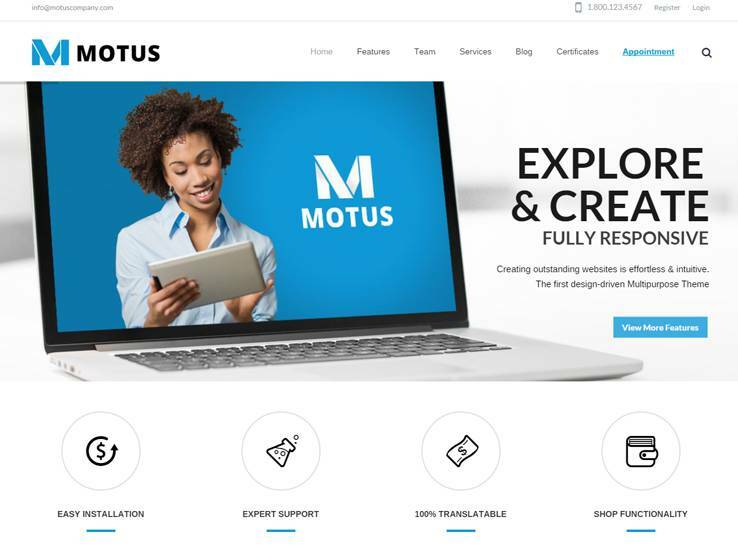 Connecting with clients is simple with the Motus theme. Your contact information can be tastefully displayed at the top of your theme alongside an engaging slider image. This slider includes overlaying text and buttons making it ideal for directing visitors to your consultation form. Other fantastic options include the ability to post fee schedules for your services, testimonials from satisfied customers, and share the latest legal news on your homepage for search engine optimization. Clients will have no trouble finding you in real life either with a map imbedded into the contact form, directing them to your office. 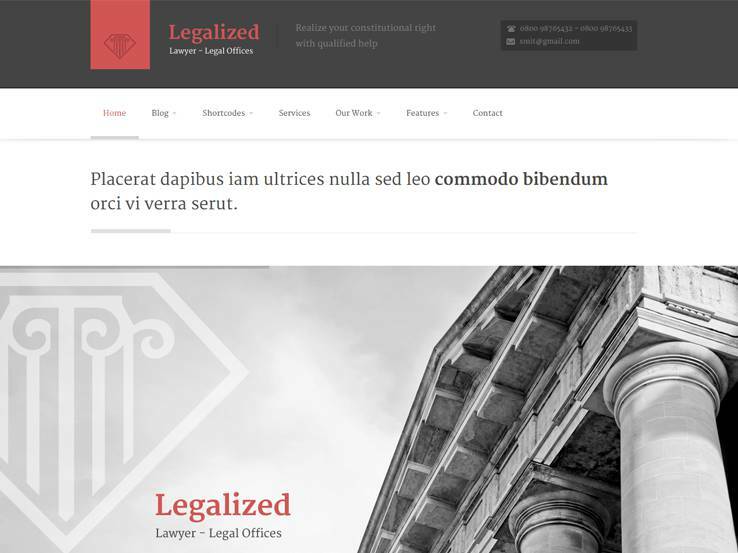 The Legalized theme was designed with the needs of a law firm in mind. Right up front, a sharp header area welcomes site visitors by showcasing your contact information, logo, and tagline. Your purchase comes with awesome page templates to make sure your site includes everything you need. Showcase your experience with the Services page and testimonials. Let you clients get to know you with the Team Members layout, a blog feed, and a fantastic gallery module. You can truly make the site your own with unlimited color options and a built-in page builder to modify page layouts by simply dragging and dropping. The shortcode generator included with Legalized also lets you add buttons, columns, and custom widgets for easy navigation. Translation options will make your site accessible to a multicultural audience but what really makes this theme stand out from the competition is its integrations with Google Maps to help clients find your office. This fully responsive theme also looks great on mobile devices. Glad you enjoyed the post. What was your favorite Theme? Helpful guidelines. Thanks for sharing valuable themes list. 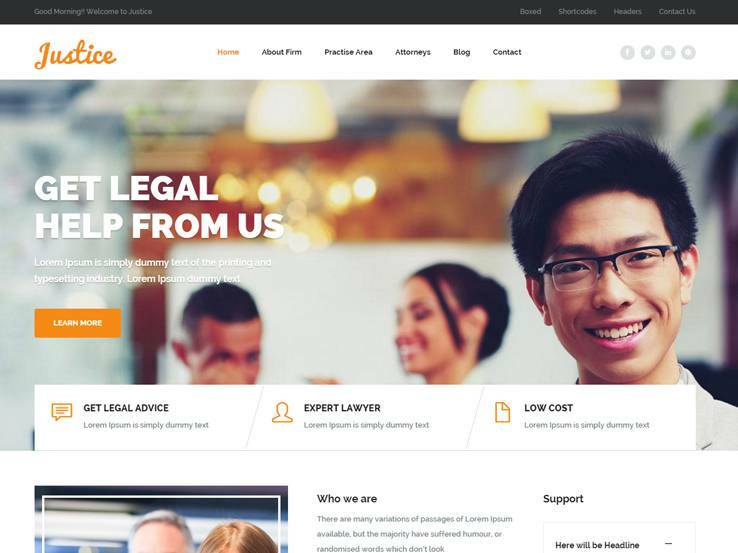 I want to suggest you Justica – Lawyer WordPress Theme.